Max. tip size: Up to 0.025"
DP-6860E is professional diaphragm pump in seiwa type, for medium to large size areas construction / building interior and outerior wall painting, house decorating, steel structure painting etc. High efficiency airless diaphragm pump for professional painters, 1800w powerful induction motor generates big capcity flow rate, save more working time and materials. Could be used for most kinds of paint, varnish, colorant, latex paint, emulsion, primers, water-based and oil-based coatings etc. Painting pressure is stable results perfect finish. Compact size, cart type and pneumatic wheels design for easy moving to any working places you want. Low noise, low pollution, low splash. 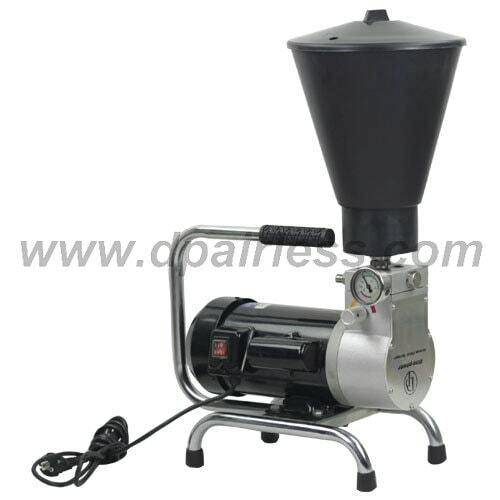 Below are more detailed photos of DP-6860E Electric Airless Diaphragm Pump for reference. please send me diaphragm specs to spray epoxy on floors? machine i need for repair kits? Please tell me price of Airless spray painter. For both using diaphragm pump and piston pump.